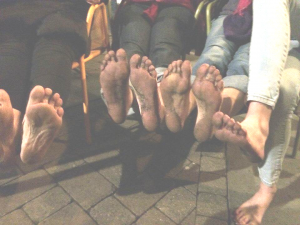 MNC Firewalking Team raise £2500 for St Catherine’s Hospice. On Friday 23rd March 2018 a brave team from The Mumpreneurs Networking Club (MNC) completed a Firewalk in aid of St Catherine’s Hospice in Crawley, West Sussex. Hospices offer respite and end of term care to the terminally ill and each of the team holds what they do very close to their heart so this was the perfect opportunity to step up to a challenge with a very good cause to support. To date we have collected £2500 for St Catherine’s Hospice and donations are still coming in. No, we did not burn our feet, not even one tiny little bit! Yes, it was super hot and our feet were very black afterwards. No, it was not dangerous and some of us walked through the coals twice! Yes, everyone hit their required fundraising target and in total as a team we have so far raised £2500 and donations are still coming in. The team will post their fundraising links in the comments below. We started the evening with pinks wigs, candy floss, dancing in the street, a glass of fizz and a fire in the high street- not your average friday night! Alongside the frivolity and fun we all learnt a very valuable lesson. Sometimes things are not always as scary as you think they are going to be. Actually the scariest moment was stepping forward and saying yes to the firewalk in the first place. All the team signed up with no idea of how it would make them feel, it was completely outside of our comfort zones! The lesson learnt from our firewalk will last far beyond friday night. By pushing the limits of what we think we are capable of we can begin to unlock the huge amount of dormant potential that we each have within us. Now we know we can walk across hot coals, we are wondering what else we can do? We have always believed at MNC, that with support, the chance to be a part of a team and offering opportunities, people are more likely to try new things. Only then can you begin to tap into your potential, kickstart your personal growth and use the experience as a catalyst for change. Every time you set yourself a challenge that is outside your comfort zone a natural momentum is sparked, all the small wins, success and triumphs join together and produce a compounded effect that means each win can be magnified ten fold. We would like say a massive thank you to all the team for being brave and stepping up to the challenge! The team for the event consisted of MNC Managers Jenni Beckwith, Marian Timms, Jess Haslett, Suzeck Taylor and Heather Johns, alongside MNC Brand Ambassadors Kate Henwood, Sandra Da Silva Creasey, Viv Lambert , Kate Nicholson plus members Charlotte Stanbridge and Holly Stone. And of course me, MNC Director Nicky Chisholm. Thank you for all your support and donations it is much appreciated! Hmmmmm Now I wonder what we can all do next!!!! !